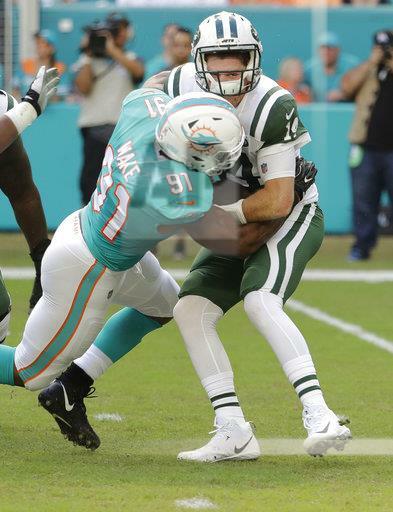 Coming into Miami today, the New York Jets were 3-5 and needed to WIN their next TWO games before their BYE week but their hopes came to DIE in Miami against the Dolphins today. The Jets defense managed to HOLD the Dolphins offense to just SIX points, but FOUR interceptions by Sam Darnold including a Pick-SIX helped the Dolphins WIN 13-6 and the MISERY continues for the Jets. The Jets offense had been RAVAGED with injuries during their TWO game LOSING streak coming into today, but MOST of those players were HEALTHY today but that did NOT affect the Jets offense. Between TERRIBLE offensive line play and BAD snaps throughout the game and TERRIBLE performance by Sam Darnold, the offense scored THREE points through the first THREE and a HALF quarters. The defense was GREAT today but they could NOT get that BIG turnover off Brock Osweiler who was a TURNOVER MACHINE coming into today. There is NO way this LOSS can be blamed on the defense but with the offense STRUGGLING throughout the game, a FORCED turnover from the defense would have helped build some MOMENTUM for the Jets. This season is ALL about DEVELOPING Sam Darnold and through the first NINE games of his career, he has some FEW flashes of being GREAT and a TON of flashes of being a BUST. It would be UNFAIR to declare him a BUST already, but LEADING the NFL in INTERCEPTIONS through Week 9 is LESS than IDEAL. The past FEW weeks, he did NOT have the offensive weapons to succeed but they were ALL healthy this week and he just did NOT have the time in the backfield to throw to them. Darnold’s FIRST interception came when the offense was having their BEST drive of the FIRST half and the second was a PICK-6 that was the DAGGER, Darnold has a TENDENCY to CHUCK the ball around the field but he has to get better at TUCKING and RUNNING at times or taking a SACK and AVOIDING turnovers. The running game was GOOD in the carries they got but they NEVER got that BIG run that could have taken some PRESSURE off Darnold and that really was the DIFFERENCE in this game. The Jets had to go 7-9 OR 8-8 in order to KEEP Todd Bowles and his staff OFF the HOT seat but that is going to be TOUGH from this point in. I am NOT in favor of FIRING everyone, but this is year FOUR under this REGIME, BAD offensive line play was the ISSUE in year TWO and it is STILL an issue, that falls on Mike Maccagnan and Bowles. This season is basically OVER but the team over the next SEVEN weeks has to shown a TON of improvements or ELSE there will be RIOTS outside Metlife Stadium after the season is OVER. The Buffalo Bills come to town next week in the LAST game for the Jets before the BYE week. The Bills are the ONLY time in the NFL that is BY FAR WORST than the Jets and if the Jets do NOT win next week, then I think the Coaching Staff could be FIRED going into the BYE week.